Today we know that there are hereditary cancer syndromes that predispose families to develop various types of cancer. Angelina Jolie’s announcement of her BRCA1 mutation and decision to undergo a bilateral prophylactic mastectomy in 2013 began what is often referred to as the “Angelina effect.” Although the numbers vary widely, it’s been suggested that the rate of BRCA testing rose 64 percent in just the two weeks after her announcement. The notion that cancers could be hereditary and passed down through families has been discussed for centuries. In 1801, the Society for Investigating Nature questioned whether there could be a hereditary component to cancer and called for research to be performed. They felt that if there was evidence proving that cancer was hereditary that it could eventually be prevented. And if they did not find any evidence supporting its inheritance, that it would be a relief to those who were anticipating a cancer diagnosis based on family history. 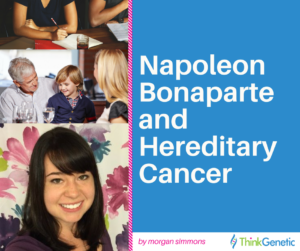 Interestingly, Napoleon Bonaparte never questioned the existence of hereditary cancer. In 1806, Napoleon began experiencing gastric problems and consulted his doctor. By 1811, he had gotten his hands on a copy of his father’s autopsy records which revealed that his father had passed away from cancer in his pylorus – the opening from the stomach into the small intestine. Napoleon asked his doctor to provide him with anatomy lessons so he could better understand what caused his father’s death. When patients understand an illness, it’s easier for them to fight. Napoleon’s condition worsened in 1817 and his health declined for what would be the final three years of his life. He spoke of cancer often and demanded an autopsy be performed and his stomach be examined when he passed. He not only asked for these results to be compared to that of his father’s, but he also wished that his brother Louis be advised of the cause of death so that he could protect himself. Napoleon’s death at fifty-one was just one of the deaths due to stomach cancer in his family. After he had passed away, others began to succumb to cancers of the stomach and throat. In fact, almost all his family, except for his brothers Louis and Joseph, eventually contracted cancer. In 1998, a researcher by the name of Parry Guildford and his team first described mutations in the E-cadherin (CDH1) gene as being responsible for the development of diffuse gastric cancer in three Maori tribal families in New Zealand. Today, researchers and geneticists believe that it may have been the cause of the hereditary cancers in Napoleon’s family. For more information about hereditary diffuse gastric cancer, visit ThinkGenetic or the No Stomach for Cancer group.